■ Identify common abiotic factors in most ecosystems. ■ List the components of air that are needed for life. ■ Explain how climate influences life in an ecosystem. Knowing how organisms depend on the nonliving world can help humans maintain a healthy environment. 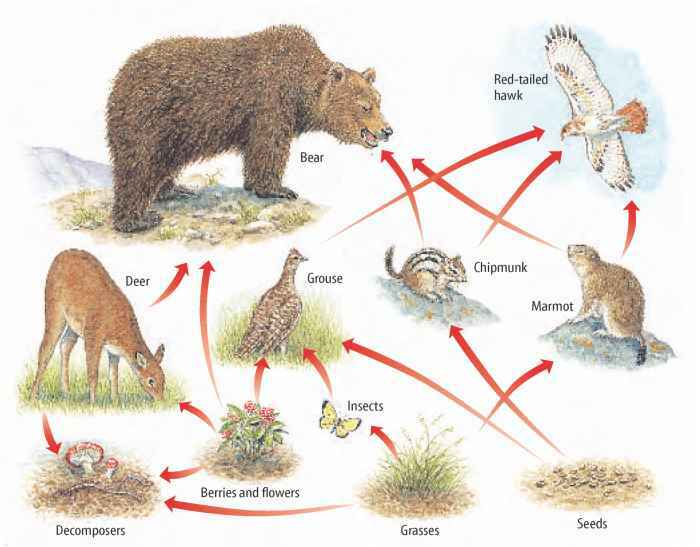 Figure 1 Abiotic factors—air, water, soil, sunlight, temperature, and climate—influence all life on Earth. Living organisms depend on one another for food and shelter. The leaves of plants provide food and a home for grasshoppers, caterpillars, and other insects. Many birds depend on insects for food. Dead plants and animals decay and become part of the soil. The features of the environment that are alive, or were once alive, are called biotic (bi AH tihk) factors. The term biotic means "living." Biotic factors are not the only things in an environment that are important to life. Most plants cannot grow without sunlight, air, water, and soil. Animals cannot survive without air, water, or the warmth that sunlight provides. The nonliving, physical features of the environment are called abiotic (ay bi AH tihk) factors. The prefix a means "not." The term abiotic means "not living." Abiotic factors include air, water, soil, sunlight, temperature, and climate. 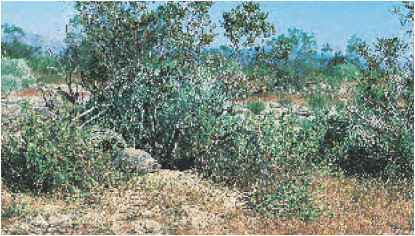 The abiotic factors in an environment often determine which kinds of organisms can live there. For example, water is an important abiotic factor in the environment, as shown in Figure 1. Air is invisible and plentiful, so it is easily overlooked as an abiotic factor of the environment. The air that surrounds Earth is called the atmosphere. Air contains 78 percent nitrogen, 21 percent oxygen, 0.94 percent argon, 0.03 percent carbon dioxide, and trace amounts of other gases. Some of these gases provide substances that support life. Carbon dioxide (CO2) is required for photosynthesis. Photo-synthesis—a series of chemical reactions—uses CO2, water, and energy from sunlight to produce sugar molecules. Organisms, like plants, that can use photosynthesis are called producers because they produce their own food. During photosynthesis, oxygen is released into the atmosphere. When a candle burns, oxygen from the air chemically combines with the molecules of candle wax. Chemical energy stored in the wax is converted and released as heat and light energy. In a similar way, cells use oxygen to release the chemical energy stored in sugar molecules. This process is called respiration. Through respiration, cells obtain the energy needed for all life processes. Air-breathing animals aren't the only organisms that need oxygen. Plants, some bacteria, algae, fish, and other organisms need oxygen for respiration. 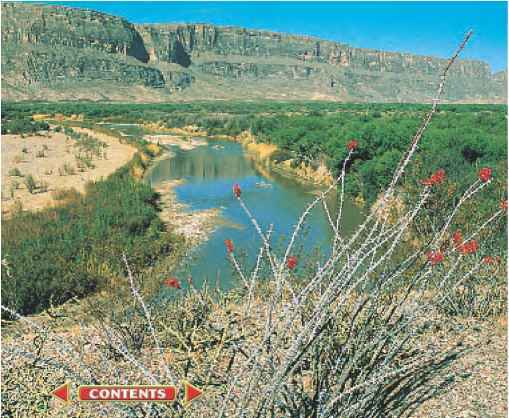 Figure 2 Water is an important abiotic factor in deserts and rain forests. Water is essential to life on Earth. It is a major ingredient of the fluid inside the cells of all organisms. In fact, most organisms are 50 percent to 95 percent water. Respiration, digestion, photosynthesis, and many other important life processes can take place only in the presence of water. As Figure 2 shows, environments that have plenty of water usually support a greater diversity of and a larger number of organisms than environments that have little water. Life in deserts is limited to species that can survive for long periods without water. Thousands of species can live in lush rain forests where rain falls almost every day. 1. Collect 2 cups of soil. Remove large pieces of debris and break up clods. 2. Put the soil in a quart jar or similar container that has a lid. 3. Fill the container with water and add 1 teaspoon of dishwashing liquid. 4. Put the lid on tightly and shake the container. 5. After 1 min, measure and record the depth of sand that settled on the bottom. 6. After 2 h, measure and record the depth of silt that settles on top of the sand. 7. After 24 h, measure and record the depth of the layer between the silt and the floating organic matter. 1. Clay particles are so small that they can remain suspended in water. Where is the clay in your sample? 2. Is sand, silt, or clay the greatest part of your soil sample? Soil is a mixture of mineral and rock particles, the remains of dead organisms, water, and air. It is the topmost layer of Earth's crust, and it supports plant growth. Soil is formed, in part, of rock that has been broken down into tiny particles. Soil is considered an abiotic factor because most of it is made up of nonliving rock and mineral particles. However, soil also contains living organisms and the decaying remains of dead organisms. Soil life includes bacteria, fungi, insects, and worms. The decaying matter found in soil is called humus. Soils contain different combinations of sand, clay, and humus. The type of soil present in a region has an important influence on the kinds of plant life that grow there. All life requires energy, and sunlight is the energy source for almost all life on Earth. During photosynthesis, producers convert light energy into chemical energy that is stored in sugar molecules. Consumers are organisms that cannot make their own food. Energy is passed to consumers when they eat producers or other consumers. As shown in Figure 3, photosynthesis cannot take place if light is never available. Figure 3 Photosynthesis requires light. 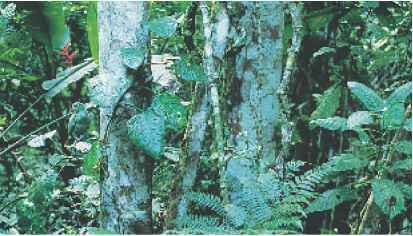 Little sunlight reaches the shady forest floor, so plant growth beneath trees is limited. Sunlight does not reach into deep lake or ocean waters. Photosynthesis can take place only in shallow water or near the water's surface. 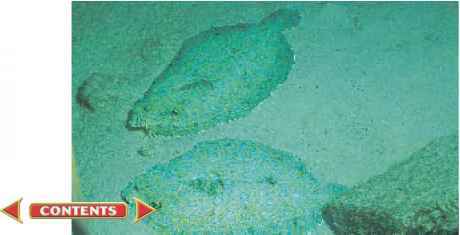 Infer how fish that live at the bottom of the deep ocean obtain energy. Figure 4 Temperature is an abiotic factor that can affect an organism's survival. The penguin has a thick layer of fat to hold in heat and keep the bird from freezing. These emperor penguins huddle together for added warmth. The Arabian camel stores fat only in its hump. This way, the camel loses heat from other parts of its body, which helps it stay cool in the hot desert. Sunlight supplies life on Earth with light energy for photosynthesis and heat energy for warmth. Most organisms can survive only if their body temperatures stay within the range of 0°C to 50°C. Water freezes at 0°C. 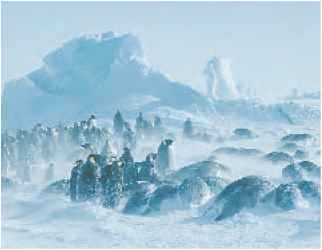 The penguins in Figure 4 are adapted for survival in the freezing Antarctic. 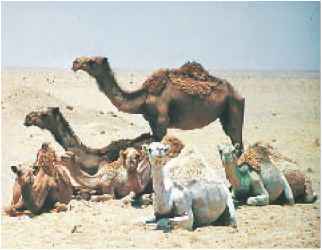 Camels can survive the hot temperatures of the Arabian Desert because their bodies are adapted for staying cool. The temperature of a region depends in part on the amount of sunlight it receives. The amount of sunlight depends on the land's latitude and elevation. I v,-^;-, -7— What does sunlight provide for life on Earth? Latitude In this chapter's Launch Lab, you discovered that temperature is affected by latitude. You found that cities located at latitudes farther from the equator tend to have colder temperatures than cities at latitudes nearer to the equator. As Figure 5 shows, polar regions receive less of the Sun's energy than equatorial regions. Near the equator, sunlight strikes Earth directly. Near the poles, sunlight strikes Earth at an angle, which spreads the energy over a larger area.